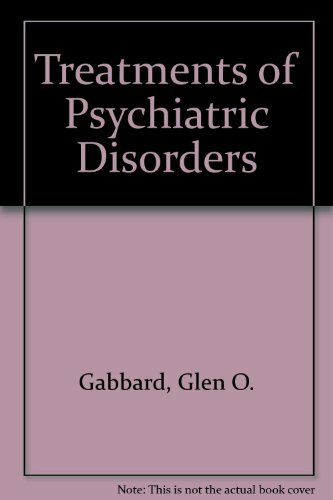 A staple of psychiatric practice through three editions, Gabbard's Treatments of Psychiatric Disorders has been thoroughly revised to reflect modern clinical expertise in a more accessible volume. More than 160 authorities share insights gained from firsthand experience in a state-of-the-art text that covers all major treatments in psychiatry linked to specific disorders, with a pluralistic approach that includes all major treatment modalities without focusing exclusively on favorite approaches. Not only has each chapter been completely updated, the text has been reorganized to facilitate its publication in a single volume that cuts directly to the heart of disorder-based treatments. Scrupulously reviewed to consolidate treatment information most needed by readers, the book is organized along the lines of DSM-IV-TR to cover the entire spectrum of conditions, from cognitive, psychotic, and mood disorders to eating disorders, sleep disorders, and disorders of impulse control. This new edition features more extensive coverage of dementia, reorganized material on substance abuse disorders, the latest research on schizophrenia, and recent advances in the understanding of personality disorders. It is an essential touchstone for practitioners and an outstanding reference for students in the mental health professions--and is now an even more useful clinical tool. Glen O. Gabbard, M.D., is Brown Foundation Chair of Psychoanalysis and Professor in the Department of Psychiatry and Behavioral Sciences, and Director of the Baylor Psychiatry Clinic, at Baylor College of Medicine in Houston, Texas. He is also Training and Supervising Analyst at the Houston- Galveston Psychoanalytic Institute in Houston. "This volume has the strengths of an encyclopedia buttressed by comprehensive and useful bibliographies." -- "The Journal of Nervous and Mental Disease", "March, 2008"